Summary: Gyakuten Saiban 6 (Ace Attorney 6 – Spirit of Justice)’s art director Fuse writes about some character design related topcs in this blog post dating from July 14, 2016. He talks about an early design for the heroine Reifa, about the Sengoku BASARA DLC costumes and makes of promotion for the upcoming artbook of the game. Images are taken from the original source article. Copyrights belong to their respective owners, etcetera etcetera. Hello. Gyakuten Saiban 6 (Ace Attorney 6 – Spirit of Justice)’s art director Fuse here. It’s been more than a month already since Gyakuten Saiban 6 was released. I didn’t manage to find the time to write a blog post before the release, so my greetings to you are somewhat late. I’ve also been working on illustration work even after the game was released, but whenever I have the time, I go around reading what you all write about it. 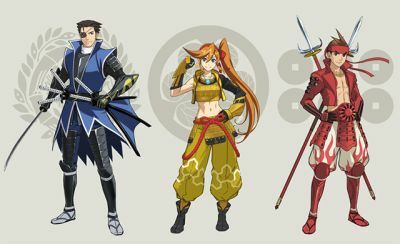 Anyway, in today’s post, I want to talk about character designs during the development cycle and tell you about the DLC and other Gyakuten Saiban 6-related information. 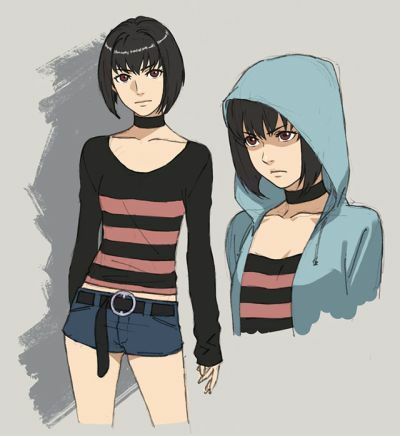 First, let’s talk about the character designs. I want to touch a little upon that symbolic character of Gyakuten Saiban 6: Reifa Padma Kurain (Rayfa Padma Khura'in). 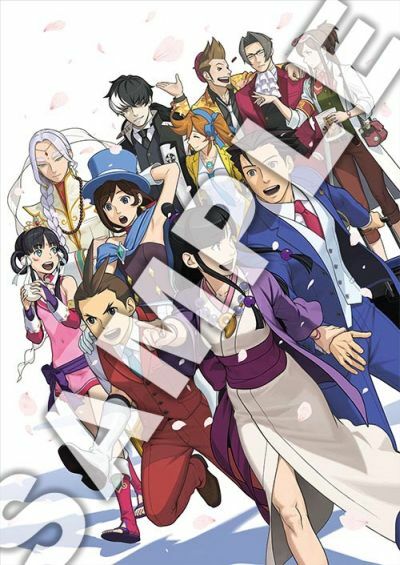 I want to talk about when it was first decided we’d be working on Gyakuten Saiban 6, before the theme of a “Revolution of the Court” was decided. We didn’t had the setting of the Kingdom of Kurain yet, but it was already decided we’d have a young girl who would be the key person in this game. This is an early design, when we were thinking about an underground court, which would be about secret cases involving politics or the legal world, which couldn’t be handled in a normal court. The only thing that had been decided was that she was an Asian, so there was nothing symbolic to her design. I was just thinking along the lines of a girl who you would just want to help. With early designs, I just get out the ideas from my personal drawer, so you can really see where my own interest lie. She doesn’t look the current Reifa, but she is like a prototype for her. From there I made a great number of roughs and patterns before we arrived a the current Reifa…and the Gyakuten Saiban 6 book featuring those early designs will be on sale on August 25! (promotion). The book has of course all the illustrations we’ve published until now, but also filled with the graphics used in the game, and rough illustrations we’ll be showing for the first time, so I think that people who already completed the game will be especially happy with it. Next I’ll talk a little about the Sengoku BASARA collaboration costume DLC from a design point of view. The Signal Shōgun in court! The idea behind these costumes started with an order they wanted another set of costume besides the “Special Costume Cet”. The Special Costume Set has Toranosuke (Furio Tigre), Tres Bien and a student uniform (for a 24-year old), each of them full of impact, but it was hard coming up with costumes that were as fun as those. 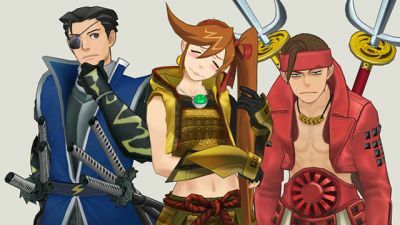 I had to think a lot as I was looking at Naruhodō (Phoenix Wright), Odoroki (Apollo Justice) and Kokone (Athena Cykes)’s models. It came to me not only because their primary colors were the same, but their characteristics and uniqueness had something in common too. To be honest, I did think that it was probably easier to come up with this idea than to actually get it arranged, but the BASARA team gladly gave their permission and so it was done! 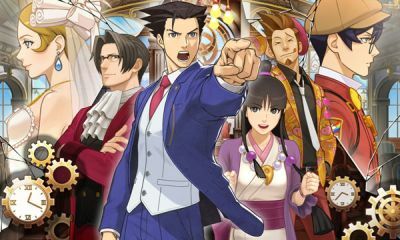 Oh, and the extra downloadable scenario Turnabout Across Time is also available now. We’d be happy if you would also play this. It’s free until July 20! The next blog post, for July 18, with be the last. Producer Eshiro and director Yamazaki will say goodbye in the final post.